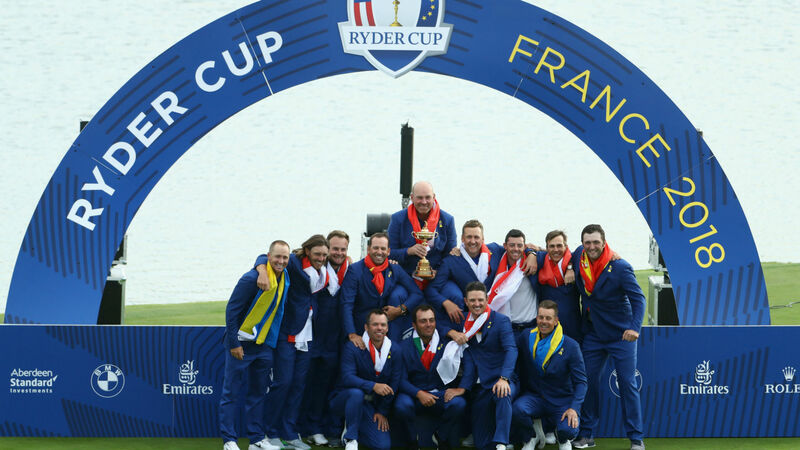 SAINT-QUENTIN-EN-YVELINES, France – The United States’ long wait for a Ryder Cup victory on European soil goes on after they slumped to an emphatic 17.5-10.5 defeat at Le Golf National. Jim Furyk’s men briefly threatened to pull off a stirring Sunday comeback, but ultimately came up well short as Europe recorded a sixth successive home win. Our Ryder Cup round-up brings you all of the key details from a memorable day in Paris. – Europe moved to the magical 14.5-point mark when Mickelson found the water off the 16th tee and promptly conceded defeat to Molinari, who was 2 up at the time. – The U.S. had initially closed to within one point, their charge starting when Thomas beat McIlroy at the 18th thanks to the Northern Irishman finding a plugged lie in a fairway bunker, failing to escape and then firing into the water. – Fittingly, the last action of the event brought one more memorable moment for Europe, Noren holing a monster putt on the final hole to beat DeChambeau. – Olesen had not played since Friday morning, but showed why Thomas Bjorn rates him so highly, thumping Spieth 5 and 4. – Finau turned in a similarly impressive display to beat the previously unstoppable Fleetwood 6 and 4. – Yet the man who took center stage was Molinari, whose victory over Mickelson saw him become the first European in history to win five matches out of five at a Ryder Cup. – Woods’ defeat to Rahm ensured the winner of last week’s Tour Championship finished with an abysmal 0-4 record. Seven days on from his drought-breaking success at East Lake, Woods must reflect on another hugely disappointing Ryder Cup campaign. – Mickelson also ended the event without a point, albeit from just two matches, while world No. 1 Johnson suffered a fourth defeat in five outings, at the hands of world number 34 Poulter.